An activist reports from G4S annual general meeting, Surrey, England, 26 May 2016. Throughout the criminal justice system, combinations of state bodies and voluntary sector organisations have increasingly been joined by private sector companies to manage and deliver services. Academics and activists have labelled this expanding marketplace as the “prison industrial complex”. Empty Cages Collective describe the prison industrial complex as not just prisons, but the “mutually reinforcing web of relationships, between and not limited to, for example, prisons, the probation service, the police, the courts, all the companies that profit from transporting, feeding and exploiting prisoners”. Globally the prison industrial complex is a multi-billion pound industry that draws together private and government interests. It profits from using policing, prisons and punishment as a response to social, political and economic problems. It is a self-perpetuating system targeting the poor, people of colour and those most vulnerable to detainment, such as those experiencing mental health, drug or alcohol problems. It reinforces and recreates inequalities, ensuring there is an endless supply of people to feed into the criminal justice system. 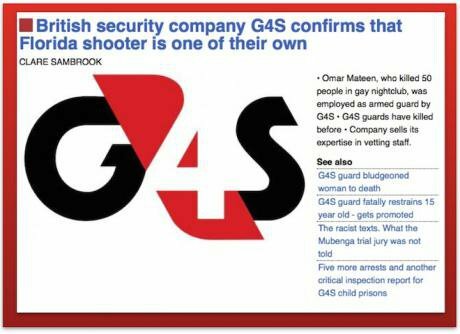 One of the private companies involved in the prison industrial complex is G4S, currently drawing international scrutiny as the employer of Florida shooter Omar Mateen who slaughtered 49 people in an LGBT night club on Sunday 12 June. A company with more than 600,000 employees across 110 countries, G4S boasts that it is “securing your world”. Their website outlines the range of services they operate in the UK, including children’s services, custodial and detention, electronic monitoring, immigration and borders, policing support services and health. G4S has drawn significant negative publicity and criticism over recent years. Throughout 2015/2016 there has been a steady flow of official reports and media exposés highlighting reasons to be concerned about the company’s services. In May 2015, Ofsted, the regulator for education and children’s services, released a report on Rainsbrook Secure Training Centre revealing that young people in the care of G4S were subjected to “racist comments”, “degrading treatment”, “while being cared for by staff who were under the influence of illegal drugs”. In June 2015, it was revealed that the Ministry of Justice were still paying G4S and Serco to deliver electronic tagging, more than a year after they withdrew from such contracts after “overbilling”. In January 2016, a BBC Panorama documentary revealed serious abuse at Medway Secure Training Centre that led to the suspension and arrest of G4S staff. This was followed by an announcement in February that they would be withdrawing from youth justice services in the UK and US. 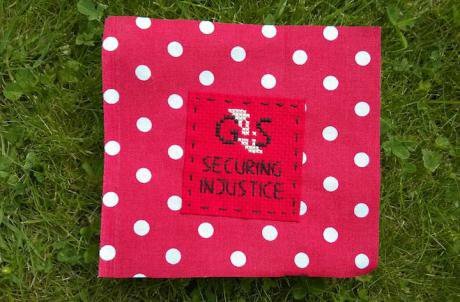 In May 2016 I attended the G4S Annual General Meeting as a shareholder, along with other members of the Reclaim Justice Network. This is the third consecutive year our members have attended. The goal was to ask the G4S board of directors about the company’s role in criminal justice services. No electronic items were allowed into the meeting, making reporting of the questions and answers, difficult. There were a number of campaigners from War on Want and the BDS movements, among others, raising concerns about G4S’s services in Israel. What follows here is a summary of some of the questions raised by Reclaim Justice Network members in relation to G4S’s criminal justice operations in the UK. The AGM took place at the Holiday Inn in Sutton. The room was lined by around twelve uniformed G4S security guards. The front row was packed with what seemed to be G4S staff. They were joined by various individuals in “plain clothes”, wearing badges marked with “Security”. John Connolly, G4S’s Chairman, opened the meeting – offering a polite, yet strong warning that anyone who disrupted the meeting would be asked to stop and then asked to leave. During his opening remarks, people around the room took turns to chant “Action”, “Not words”. And “Shut”, “Them”, “All”, “Down”. The first shareholder question was from a man representing a large pension fund with investments in G4S. He raised concerns about the use of excessive force as seen at Medway Secure Training Centre in an undercover BBC Panorama documentary. He asked whether such incidents would affect the value of investments and if it had directly impacted upon directors’ remuneration. In response, John Connolly, who last year took £370,000 in fees and benefits in his part-time job as G4S chairman, said there was a “rigorous process” for assessing the senior management team. Ashley Almanza, the G4S chief executive, followed on, stating the contract had now come to an end after an agreement with the Ministry of Justice that it would not be extended. Almanza, who took £2.5 million in pay and bonuses last year, said the BBC Panorama documentary had been “appalling” and “shocking”. He claimed there were “rigorous methods” for recruiting staff and it had been “deeply disappointing”. He defended the services in Medway and Rainsbrook secure training centres, pointing out both had achieved either “good” or “outstanding” inspections. Almanza said that lessons had been learned from Medway and shared across the whole prison estate. One shareholder raised the issue of the restraint of children at Medway, as revealed by Panorama, and asked what G4S is doing to remedy the harms experienced. Almanza said that it was important to understand the distinction between restraint techniques developed and approved by government – and “individuals ignoring policy and training”. He said that Medway offered a “learning point for everyone involved and across the UK”, as after Panorama’s revelations, “methods have changed”. Almanza said that G4S want to work with the government to improve safety and mentioned the trialing of body-worn cameras. In later questioning Almanza also emphasised that the company had withdrawn from all “juvenile custody” services in both the UK and USA. He was asked a number of times for clarification on the reasons for this withdrawal but seemed reluctant to offer a direct response — or accept any connection to the incidents at Medway. He eventually said that the company wants to focus on areas they believe they can do the “best job” to “benefit our shareholders”. The board was asked if there were any other outstanding and undisclosed investigations into the behaviour of staff in relation to the treatment of children and young people in secure training centres and children’s homes. Almanza said that he was not aware of any “government investigations”. The shareholder asked again, whether G4S knew of any ongoing and undisclosed investigations into G4S staff behaviour towards children. Almanza responded that it was difficult to say given the number of people they are dealing with and can’t necessarily be aware of all incidents. The shareholder again asked for confirmation: “So, to be clear, shareholders are unlikely to hear further revelations about this kind of thing?” He said that a “hotline” has been set up for staff to report any concerning behaviour, but as this is a new process, he did not have figures. On 8 June 2016, just a couple of weeks after Almanza’s response, a statement from G4S confirmed that five more G4S staff from Medway STC had been charged by Kent police. A question was posed on the right to life, on self-harm and self-inflicted deaths in G4S prisons. A shareholder highlighted that 6 people had died in HMP Altcourse and in 2013 there were more than 900 recorded incidents of self-harm. The shareholder asked whether this “tragic pattern” indicated a failure in the duty of care for human beings. Almanza emphasised that these are not G4S prisons, and that they are owned by the Ministry of Justice. “G4S runs them,” he said, “with oversight from government”. Almanza said that self-harm and deaths in custody are experienced across the prison estate. He said that all members of the board have visited G4S run prisons, and boasted that “you as shareholders would be impressed by the way staff run the prisons”. They are “difficult environments” to work in and he emphasised the “skill of staff”. Almanza said the company will look to continue to reduce self-harm in prisons. The same shareholder then detailed how at a public meeting in February 2016, attended by around 80 people, they had heard a G4S prison custody officer detailing the alleged response by staff to a prisoner who had attempted to take their own life by burning themselves through lighting matches around their clothing. Almanza asked for “evidence”. He said “our facilities are inspected continuously” and said the shareholder had “made a serious allegation” – “provide us with evidence and we will investigate”. The shareholder in question, Dr David Scott, spoke to Ashley Almanza and John Connolly after the meeting. They invited him to put his concerns in writing which he did so the same week. He is yet to receive a reply, but you can read his letter here. It eloquently outlines very important issues relating to G4S commitment to human rights. Scott also asks that “G4S undertake a thorough investigation into the treatment and response of staff to prisoners who self-harm, experience mental health problems and / or experience or have acted upon suicidal ideation”. The questioning then moved onto electronic monitoring and G4S overbilling the Ministry of Justice. Almanza said it was important to understand that electronic monitoring services covered the “tracking of products and goods”. He said they will continue to offer it for prisoners as well as for goods and look for new markets. I didn’t note the exact wording but I remember feeling very uncomfortable at the implication that prisoners were simply “goods” to be tracked and monitored. One shareholder highlighted G4S’s claim to be a leading company when it came to human rights. She asked what assurances the Board could provide that human rights and civil liberties are a priority — and asked what individual members of the Board are specifically doing to protect human rights and civil liberties. Clare Spottiswoode (a non executive director and chair of the G4S Corporate Social Responsibility Committee who takes £81,500 per year for her part-time G4S job) was invited to respond by John Connolly. She said that “human rights are central to our work” and that the company aims to “spread good human rights work wherever we go”. Shareholder, David Scott who had raised a number of questions about the company’s commitment and record on human rights, asked whether G4S could guarantee a focus on human rights in next year’s annual report. Almost two hours into the meeting, John Connolly, said yes, they would take that as a recommendation from the meeting and consider conducting a human rights audit. After two hours of shareholder questions, the chairman then attempted to bring the meeting to a close. At this point a number of shareholders, who had largely posed questions on G4S’s role in Israel, began to shout and disrupt the proceedings. One by one, people were dragged out by the G4S security staff. The first person removed from the meeting was a man shouting “shut down Yarl’s Wood” — referring to the notorious Bedfordshire detention centre run by Serco where G4S has provided health service since September 2014. Following him, a woman in the process of being carried from the room had some of her clothes pulled from her body. Two other women who objected to this were escorted out. Another man was then dragged out, grabbing empty chairs as they removed him while shouting “you are all complicit in the worst human rights violations”. As the chairman read out the resolutions to be voted on, we could all clearly hear the same man chanting “G4S, shame on you” from outside the door. The meeting was enlightening and frustrating. Clear answers were rarely provided by G4S to what were very direct questions from shareholders. The chairman, John Connolly, referred nearly all questions to Ashley Almanza. With the exception of Clare Spottiswoode, the rest of the board sat in almost complete silence. Staring at the room or down at their paperwork, I couldn’t work out whether this was boredom or embarrassment. They certainly appeared uncomfortable. When a shareholder challenged them on this — asking why no one else on the Board was asking questions — they continued to sit in silence. The key message from Almanza on questions relating to safety in prisons, deaths in custody, self-harm and the use of restraint was that they are part of wider problems in the criminal justice system. On one level, he is right — prisons are damaging institutions, no matter who runs them. However, it also felt like he was trying to avoid responsibility and evade blame for a catalogue of serious issues raised by shareholders. This prison industrial complex captures people. It punishes them. It damages people, their families and communities. It spits them back out. G4S and other companies are complicit in this – they do the dirty work of government whilst turning a profit. People are not “goods” to be transported, imprisoned and monitored.